Immunogen :ATG5 antibody was raised against a 16 amino acid synthetic peptide from near the amino terminus of human ATG5. Sample Data :Western blot analysis of ATG5 in rat spleen tissue lysate with Anti-ATG5 at (A) 2 ug/mL and (B) 2 ug/mL. 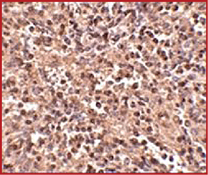 Sample Data :Immunohistochemistry of ATG5 in human spleen tissue with Anti-ATG5 at 2.5 ug/mL. 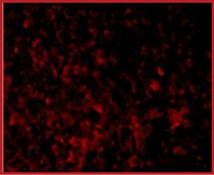 Sample Data :Immunofluorescence of ATG5 in Human Spleen cells with Anti-ATG5 at 20 ug/mL. Scientific Background :Autophagy, the process of bulk degradation of cellular proteins through an autophagosomic-lysosomal pathway is important for normal growth control and may be defective in tumor cells. It is involved in the preservation of cellular nutrients under starvation conditions as well as the normal turnover of cytosolic components. This process is negatively regulated by TOR (Target of rapamycin) through phosphorylation of autophagy protein APG1. ATG5, another member of the autophagy protein family, forms a conjugate with ATG12; this conjugate has ubiquitin-protein ligase (E3)-like activity for protein lipidation in autophagy. This conjugate also associates with innate immune response proteins such as RIG-I and VISA (also known as IPS-1), inhibiting type I interferon production and permitting viral replication in host cells. 1. Gozuacik D and Kimchi A, Autophagy as a cell death and tumor suppressor mechanism. Oncogene 2004; 23:2891-906. 2. Kisen GO, Tessitore L, Costelli P, et al. Reduced autophagic activity in primary rat hepatocellular carcinoma and ascites hepatoma cells. Carcinogenesis 1993; 14:2501-5. 3. Kamada Y, Funakoshi T, Shintani T, et al. Tor-mediated induction of autophagy via Apg1 protein kinase complex. J. Cell. Biol.2000; 150:1507-13. 4. Hanada T, Noda NN, Satomi Y, et al. The Atg12-Atg5 conjugate has a novel E3-like activity for protein lipidation in autophagy. J. Biol. Chem.2007; 282:37298-302.